The Aeroflex-IFR-Marconi 2948B is available to buy refurbished used or rent, usually from our UK stock. Click here to download the Aeroflex-IFR-Marconi 2948B datasheet. The 2948B Communications Service Monitor is the lightest, most rugged service monitor available with low phase-noise signal generation. For field work, the 2948B provides an excellent combination of instruments for all types of maintenance work. In the workshop it provides all of the performance you would expect for exacting measurements. 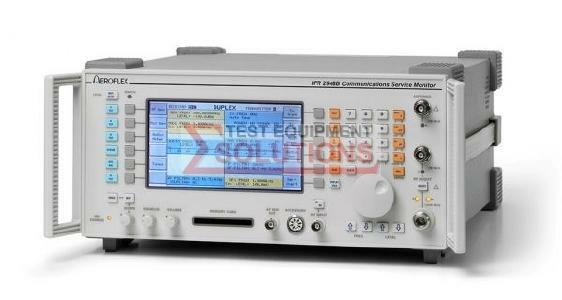 We offer the refurbished used Aeroflex 2948B Low Phase Noise Communications Service Monitor for sale and rental. The Aeroflex-IFR-Marconi 2948B is fully tested and refurbished in our in-house ISO9001 calibration laboratory. We supply manuals, accessories, full warranty and a free-of-charge Certificate of Conformity. We can also provide the Aeroflex-IFR-Marconi 2948B with a fresh calibration for a small additional charge. If you have under-utilised test equipment talk to us about trading-in or part-exchanging it towards the Aeroflex-IFR-Marconi 2948B or other refurbished test equipment.